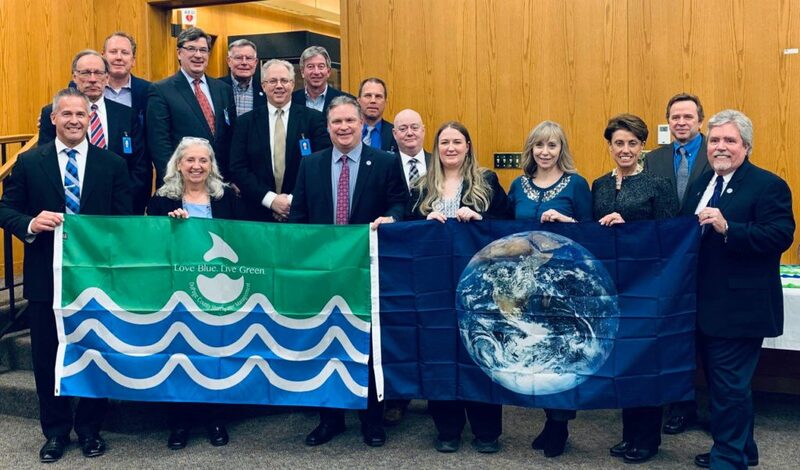 In January the DuPage Water Commission in Elmhurst was awarded both the Earth Flag and Water Quality Flag from SCARCE and DuPage County. Their efforts to earn the environmental certifications include many green infrastructure projects such as a 6,200 square foot green roof, a permeable parking lot, and 13,000 gallon rain cisterns, a solar wall, and double-pane low E glass windows. They also have many green practices such as a green cleaning regimen, internal recycling programs for CFLs, batteries, ink and toner, scrap metal and electronics and a fleet management system that saves 10,000-15,000 gallons of fuel each month. Further, they host community groups and teachers each year to educate on our water system and their on-site environmental efforts. Well done! DuPage Water Commission and DuPage County Stormwater Management Committee Chair Jim Zay , DuPage County Environmental Committee Chair Liz Chaplin, County Board Member Sean Noonan and SCARCE Founder Kay McKeen present flags to the DuPage Water Commission Board, including County Board Member Jim Healy, and staff. SCARCE gets all sorts of LP records as part of our rescue projects. Many of those records go for resale to the public in our our Used Book & Record Sale, which raises funds to support our Book Rescue. Some records are so old, the technology to play them is not available. This was the case for a large stash of 78rpm records that had accumulated. 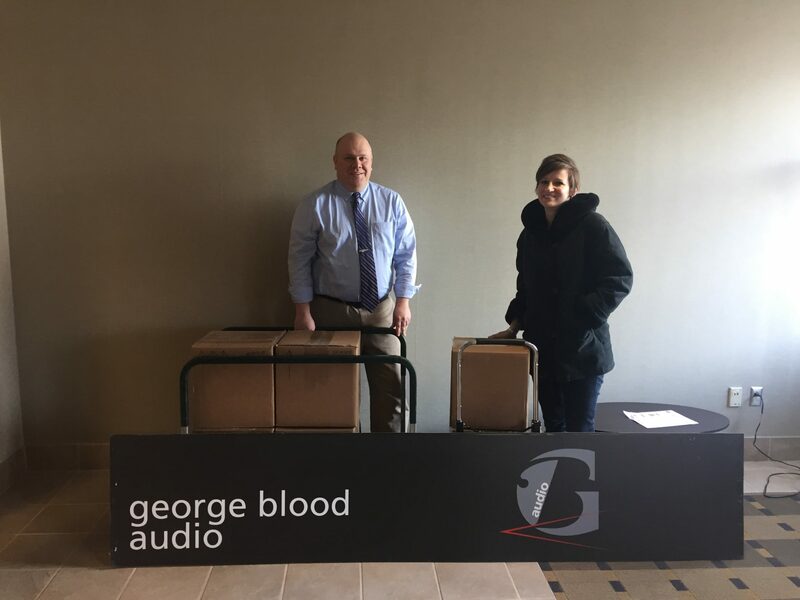 In true SCARCE fashion, rather than dispose of them as outdated technology, SCARCE record project lead volunteer, Jim Marshall, did some research and found The Great 78 Project, which is working to preserve and digitize 78rpm records – many of which hold music recorded nowhere else. The only problem: The Great 78 Project is based in Philadelphia and the records themselves are very fragile. Luckily for us, word got to local music enthusiast Shawna Flavell, who was already headed to Philly and jumped at the chance to preserve music history. 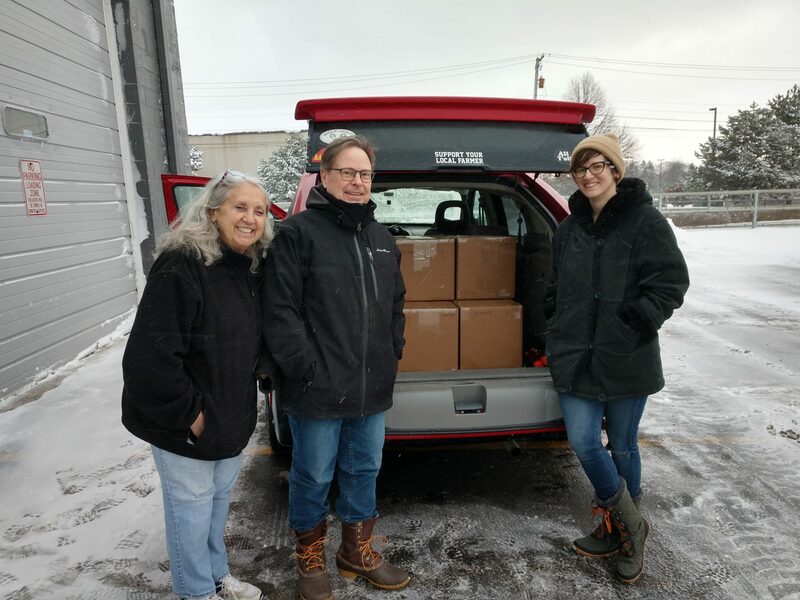 So in January, Shawna came to SCARCE, and loaded up her car with 1,010 78rpm records before hitting the road. Jim and Shawna – you rock!